Chili isn’t a Mexican dish at all, but Mexican-American. 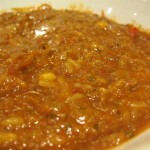 The primordial chili of Texas contains beef, chiles (both dried and fresh), onions, cumin and little else. The “San Antonio Chili Stand” at the 1893 Columbian Exposition in Chicago introduced the (since 1977) official dish of Texas to a wider audience. Many variations developed, including Cincinnati-style (with Greek spices like cinnamon and served over spaghetti), Louisville-style (also served over spaghetti) and white chili (with chicken instead of beef and only fresh chiles). Beans and tomatoes also became common additions. 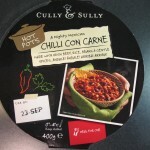 Cully’s version (he’s the chef, Sully runs the business) is a mainstream interpretation. The spicing is gentle and cumin-forward. It’s very thick and includes beans, corn and a bit of rice. It makes a nice lunch, and the box suggests serving it over baked potatoes for two people. Nutritionally it’s not great, though it does have a nice amount of fibre, but hey, it’s chili. Have a salad with it to round things out.